Nope, this isn’t Star Wars and we’re not talking about real puppy clones. 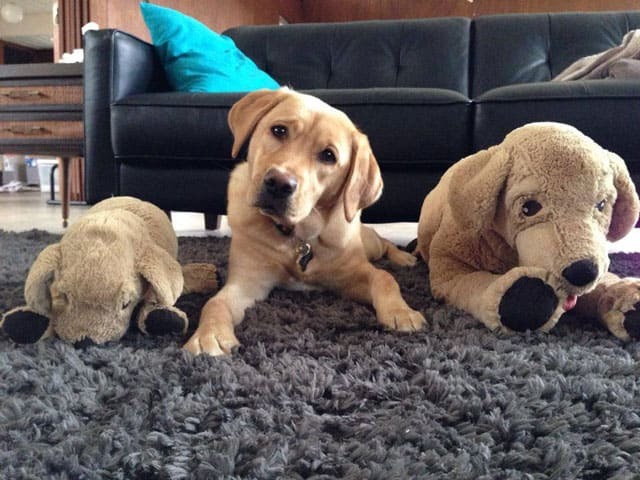 These are just plush puppy clones, but they sure do look like the real thing. Don’t they? Will the real Adelle please tilt your head? The puppy on the left was Adelle’s little play buddy from her first days with us. We rubbed plush Mini-Adelle all over her litter mates so that Real Adelle would have the scent of her litter mates in her kennel when we worked on her crate training. We ended up getting plush Maxi-Adelle when we saw her on sale at IKEA. Luckily Adelle is not as heavy a chewer as Dublin. Some of Adelle’s plush toys have long since been destroyed, but plush Adelles are still in pretty good shape and living at the house. How long do your plush dog toys usually survive? Our plush toys last about 1 minute on a good day. I do not even buy them anymore. Cute picture and an adorable head tilt! We got a plush toy at BlogPaws in May that was bisected just last night… it lasted quite a while! That head tilt shot is absolutely classic. That’s a pretty good life span for a plush toy! It all depends on how Jazlyn is feeling that day! With her sharp puppy teeth she rips most plush toys right open if we aren’t careful, but she has yet to figure out how much fun stuffing is to play with. I hope you and Jazlyn are doing well! Most of our puppies in training have been pretty destructive with their plush toys. I’ve noticed that usually when my puppy becomes real quiet she is de-stuffing one of her toys.